In the late fifties, Danelectro introduced their UB-2 five string bass. It was neither a huge success or a great new bass playing innovation. Five string upright basses had been used in jazz bands for years and the orchestral double bass had a 5 string version. In recent years they have become more popular. Some see them as oddities that make no real improvements to the art of playing the bass guitar. Others think they are the best thing to emerge in recent years, opening up a new scale and sound options. So, What’s The Best 5-String Bass Guitar? Yamaha does make quality instruments and this bass guitar is no exception. The body is crafted from Alder which is an interesting choice. It is a hardwood but is the softest of the hardwoods, which has an attractive maple laminate. The body shape is then sculpted to really give it an eye-catching look. The neck has a 5 piece mahogany/maple build that is very stable and secure. A Yamaha designed die-cast bridge is included with string width gap of 18mm allowing plenty of room for all playing styles. 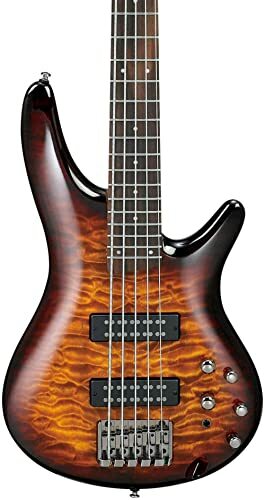 Suffice to say that both kinds of wood used and materials for the hardware are all of high quality and Yamaha have not cut corners in producing this excellent quality bass guitar. It is the pickups and electricals though that is worth some consideration. Included are H5 magnetic double coil pickups which have a quad pole design with Alnico magnets that create some clean and warm tones. The controls will take a little getting used to incorporating as they do, treble, mid and bass boost cuts on separate dials, a balancer for bridge and neck pickups and as this guitar is dual active/passive, a toggle switch to flip between the two. The three band EQ has an active/passive preamp. On the underside of the body is the compartment for a battery. There is an LED low battery alert light. The playing action of this bass guitar is surprising. It is smooth and comfortable and the fretboard though a little wider than its 4 string cousins feels easy to play. There is no doubt this is a superb bass guitar. It brings Yamaha build quality and adds some great innovations to help you create and develop your own sound. And the price? Well, let us just say it is cheap at the price. Beautiful build with quality materials. Great sound options built in. David Schecter set the company up in 1976 originally to manufacture replacement parts for Fender and Gibson guitars. Now they have a full range of instruments themselves, some hand made. They make quality instruments at very affordable prices. The Stiletto Studio-5 bass is a very special instrument. We don’t usually like to comment on how good a guitar looks, being more interested in how it sounds and what it plays like, but we will make an exception for this. It is stunning looking. Made from mahogany, it has contoured edges and two deep cutaways giving full access to the maple and walnut neck and rosewood fingerboard. The neck is a traditional ‘C’ shape and is easy to play. Two humbuckers are the choice for the pickups at neck and bridge positions. There is a 3 band active eq to allow sound creation and a blend control to mix the sound between the pickups. Grover tuners are included to ensure ease of tuning and stability. This bass guitar has a big sound generated by the EMG pickups and helped along the way by the EQ options. The bass, mids and treble controls allowing depth and a lot of top end. It is both warm and crisp and has a powerful sound and an abundance of sustain. You will not get a traditional bass sound from this guitar. It has its own sound which we have to say is very good. Lots of bottom and mids, but access to some twangy top if that is what you want. It looks and sounds very impressive, and it is, and at the price, it’s an absolute steal. Well made from good materials. Another 5-string from Schecter. Similar in some ways to the Stiletto but a slightly cheaper version. The body is mahogany, still with attractive contour edges and the thin ‘C’ neck maple with rosewood fingerboard and a two-way adjustable truss rod. It has a full 35-inch neck with double cutaways giving full access. Schecter have put their own Diamond bass pickups on this model, one at the bridge, one at the neck. It has a master control and two band equalizer controls which shape your sound and a pickup balance or mix control. Tuners are by Schecter. As with most things Schecter, this guitar is beautifully made with a lot of attention given to detail. The body finish is beautifully crafted giving you an impressive looking instrument. Sound wise it is very aggressive. It is deep and very punchy with a lot of drive and sustain. This bass guitar is not going to suit some styles of playing or genres of music. If though you are looking to give it some air and maybe solo it a bit, it will be very good. It has a lot of metal sound about it without really trying and really drives on at the top end, but keeping a bottom end that is clear and not muddy. For the price, it is outstanding value both from the sound it creates and the quality of the construction. It is heavy and the neck not that easy to navigate around so maybe not a guitar for a beginner. If you are wanting to get a new sound and feel, then this bass is definitely worth a look. Quite heavy and a little awkward to play. As we review these bass guitars one thing begins to be apparent. The quality of the build and design of these instruments is outstanding, and this Ibanez is another good example of that. The body is mahogany with an eye-catching maple top in a dragon’s eye design. On the underside, there is a compartment for the 9v battery. The neck is a five-piece affair, made from maple with a rosewood fingerboard. Humbuckers have been included in neck and bridge positions. These are PowerSpan Dual Coil pickups which are very responsive especially among the higher frequencies. There is a three-band EQ with three major control settings. The first or tap mode will give you a clear, very clean single coil sound with a lot of top end. The second, Series mode brings in the humbuckers with that warm full tone with plenty of bottom end. The third, power tap mode brings them both together, allowing you to combine the sounds to create exactly what you want. The varieties of sound that the guitar is able to achieve are greatly assisted by having active electronics with the split coil passives. It is a combination that works very well. We wouldn’t say that this is the best bass guitar Ibanez has ever produced but it has a lot going for it. It is certainly very easy to play and the double cutaways allow full access to the fingerboard, and it is of course beautifully designed and manufactured. The sounds on offer from the PowerSpan pickups won’t be to everyone’s taste but they give options and have a range of tones. Price wise it is an excellent choice and good value for money. Very well made and nicly designed. The sound might be a little thin for those who like rich tones. We are looking at 5 string basses and say the words bass guitar and you think Fender. We are all aware of what they have given the world in 4 string guitars, let’s see what they have given to the marketplace for 5-string basses. The Squier Affinity is a budget range of instrument produced by Fender. No frills, no nonsense premium brand by a quality manufacturer. However, the first thing you notice is that they have hardly been what you might call adventurous in its design. Maybe they feel they don’t have to be, but compared with some of its competitors, this bass looks quite ordinary. Having said that it looks like a Fender and that is possibly the reason. They have taken the Jazz bass design to deliver their 5-string. 34-inch ‘C’ shape bolt-on neck with a double cutaway, made from maple with a rosewood fingerboard. The body is made from Alder. No fuss with the electrics. Two single coil pickups, one central, one at the bridge with a tone control for each and a master volume. They produce a punchy sound at the top end with warm tones from the bottom. Fender label this bass guitar as being for a beginner. Possibly, but it would do well in the hands of someone who knows a little of what they are doing. Cosmetically it is a long way behind its competitors and with most of the opposition supplying humbuckers and other little extras, it could be said that this bass is nothing out of the ordinary. What it does do is bring that solid Fender based know-how to the table in a plain package without any frills at a ridiculously low price. For many people that is going to be more than enough. With this bass guitar, you get what you see, and hear. It’s not precocious, it does its job and does it well. For the price, it does it very well indeed. Fender know-how in producing quality bass guitars. Clean sounds with lots of punch. Some might say it has few sound options. Ibanez offers something a little different with this bass guitar. They have produced a short scale instrument with a lightweight body. The first thing you will notice when you handle this guitar is the weight. With a body made from Poplar, you have none of the weighty feel of mahogany or other common woods used to construct guitar bodies. It is very lightweight. The neck is short scale and made from maple, and it is a fast neck. Short scale necks are of course lending themselves to less stretching and smaller distances to cover which naturally makes them quick and easy to play. Smooth and fast, the notes fairly tumble out of the slimline neck. Immediately we are thinking this is a guitar designed for a beginner but that might be unfair. We know a lot of bass players who prefer a lighter weight and a short scale neck and if that is you then you are in luck. It comes with J5 single coil pickups and an active PHAT-II bass boost. The pickups are not that powerful and the bass boost will come in useful. It is a bit bottom heavy though and you may find you will lose a little bit of top end when using it. Price-wise this guitar is a bit of a no-brainer. Well made, nice sound, lightweight and short scale, it has a lot going for it. Some may not like the short scale, but for others, it will be a major plus. A good option to consider. Some might think it a bit under-powered. It is very interesting to note in doing this review of the best 5-string bass guitars that so many of the instruments have a very similar body shape with similar cutaways. This Dean 5-string is no exception. Its physical likeness to its competitors, with one or to exceptions, very apparent. It has a nicely crafted basswood body that enjoys some contours for ease of playing and comfort and a maple neck with a walnut fretboard that has a thin line and is easy to play for a 35-inch scale. It has a dual action truss rod. The hardware is basic but attractive. Sealed die-cast tuners and a die-cast bridge with chrome controls. It all matches the simplicity of the design of the guitar. It has one bridge pickup with a volume and tone control. Given that it is such a competitive price, how does it perform? Surprisingly well. We don’t want that to mean anything other than when you pay what is a very low price for a guitar, you do not expect too much. We have said many times in these reviews that usually you only get what you pay for. This Dean 5-string bass goes quite a long way to dispelling that theory. It’s easy to say it is good for the money, but forget the price for a minute, this guitar is really quite nice. It rumbles just a little at the bottom end but it carries enough basic clarity to overcome that potential issue and the top is very clear and defined. It plays very quickly and is comfortable to hold. Lacking a little in the sound creation area, because of having only one tone control, but a decent amp will give you some more options. It might be low-end cost-wise but not in playability and performance. Not too many options on the guitar sound wise. Another bass guitar at the cost-effective end of the scale is this Rogue. Not a manufacturer that immediately springs to mind for many of us, they have a fairly low profile. 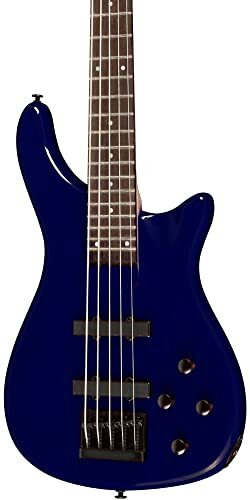 They are though attempting to get into the marketplace and are producing some very good bass guitars at very good prices in an attempt to do so. The LX205 is an example of their product line. It is fairly standard with its material selections -basswood body and maple neck with rosewood fretboard – as we have seen on a few other instruments. The design in effect mirrors so many of its competitors. The neck is fast to play and smooth in its feel and helps to deliver a nice warm tone. There are two split coil pickups with a volume and tone control for each giving you a few sound options. Die-cast tuners and jet black hardware give this guitar a nice look. The sound for a guitar with such a low price tag is really quite a pleasant surprise. It will never compete with the big boys of course but then wasn’t supposed to. The sound it produces is good quality and far exceeds the price tag expectancy. The bottom end is rich and it has a powerful vibrant top. It is a good guitar and for the price, an exceptional instrument. As premium price, 5 string bass guitars go, you will be hard pushed to find better value for money anywhere. If Rogue continue to make quality instruments available at such good prices then it won’t be long before they have developed a solid reputation and a sound customer base. Well made and good looking guitar. Nice sounds with adequate tone controls. Maybe lacks a bit in the sound creation area. This time we would buck the trend. Most people who read our reviews will be aware of how highly we rate the impact of Fender guitars but more especially Fender bass guitars. But this time we will choose something different. Not the cheapest by any means but a stunning instrument on every level.